Our mission | KAJI TECH CO., LTD.
Our aims are to contribute to society and improve poeple’s lives through our earth-friendly products. Japanese people realize how important it is to maintain good relationships between people, therefore we care deeply about others and wish to take care of nature, especially after the disaster in 2011. We supply products that are eco-friendly and harmless to humans. Our main product, plastic snap fasteners, won’t cause hazardous gas after burning. There is no effect from either cold or warm temperatures, as well. Also, they are allergy-free. The material, shape and design is harmonious with humans and nature. About ten years ago, almost 100% of the snap fasteners on baby clothes in Japan were metal. However, we hold the belief that plastic snaps are the best and safest for babies and small children. Today, more than half of the baby clothing in Japan uses plastic snap fasteners, proving people have realized our snaps are better. We have other accessories as well. Though it may seem like a minor detail in a clothing design, the type of fasteners chosen are nonetheless a necessity, and will always be one. 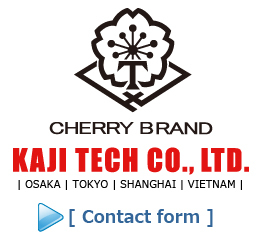 Even now, it is probable that some products from Kaji Tech are around you at this moment. We have now entered our 91st year as a company. From this point on, we will keep working hard and aim to reach our 100th anniversary. We are expanding our buisiness abroad with the hope of contributing to it with our high-quality products.